How much does Invoiced cost ? 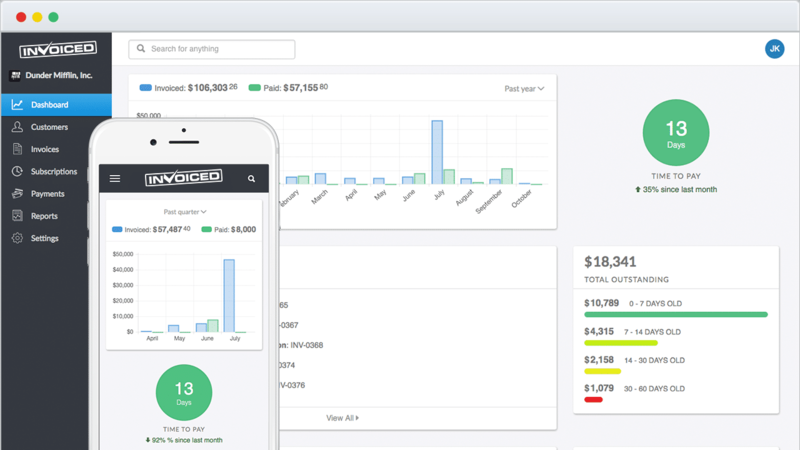 The pricing for Invoiced starts at $10.0 per month. 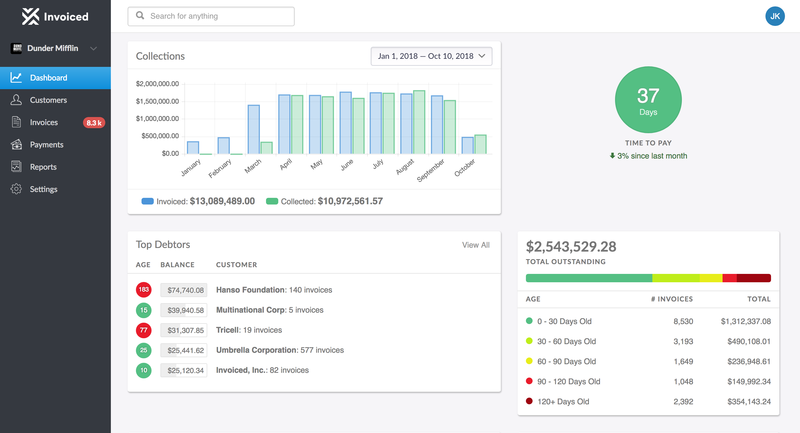 Invoiced has 3 different plans such as - Solo at $10.0 per month, Startup at $50.0 per month and Growth at $100.0 per month. Invoiced also offers a custom plan based on the customer's request. Invoiced is organized well. Easy to find what you're looking for in most cases. Not as intuitive as programs like Quickbooks. Column names / field could be clearer. Setup could be simpler..
Pros: The overall software is great! really innovative. Cons: - Lack of features to customize the invoice PDF. - Customer Support, No live chat, not very communicative support team, for some reason they never understand what i want. It's one of the easiest softwares to use. I loved that I could sign up for a free trial to know if it was worth it. 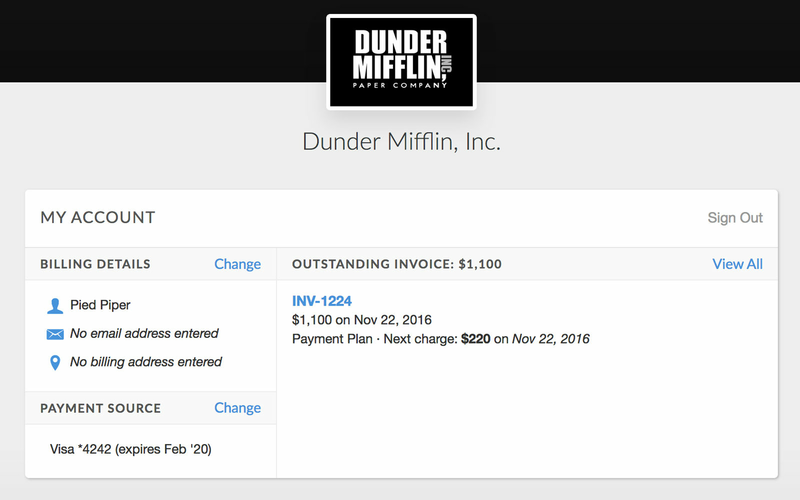 The ability to have flexible invoicing to send to my customers. "Invoiced powers my entire business"
The flexible recurring payments piece is the most powerful part. The fact that they just charge a flat monthly fee and don't take a percentage of revenue is amazing. And it's just simple, easy to use and it works. 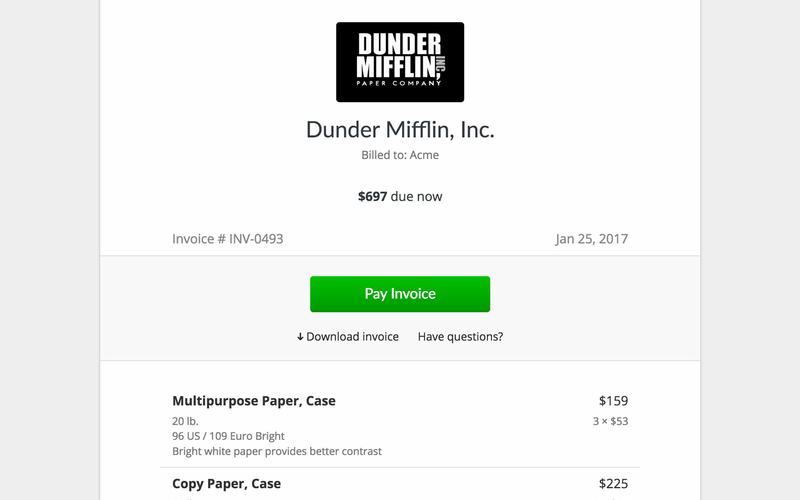 Invoice chasing is also a great feature. My only dislike is that I can't do a product page. I can do a subscription page at the moment, but not a product page link. Try it out. It's great and easy to use! It enables us to do monthly subscriptions for all of our customers with a ton of flexibility. We can easily adjust dates and extend customers if we need to. Cons: It is not translated in all languages properly, which means you have to customize a bit the layout of the invoice. Pros: Making invoices can seem daunting but the templates they provide make creating invoices a breeze. I can do everything I need and even go back and edit if I make a mistake. Also the free version has many options so you don't need to upgrade. Pros: The layout of this software is very simple to use and creates a great flow to the webpage. They set up a lot of automated emails so that you don't have to fill anything out, saving you time as a customer. Cons: The tabs are sometimes difficult to navigate because categories aren't where you would assume they would be placed. 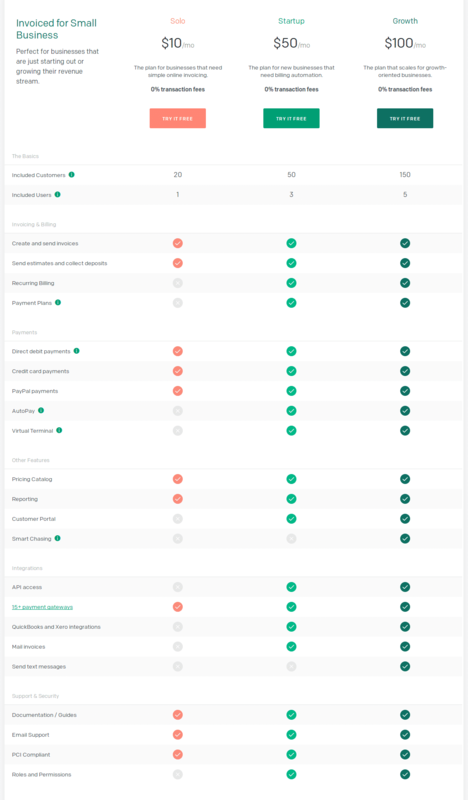 Pros: The ease of use in managing invoices and payments, perfect compatibility with stripe and the possibility of using the subscriptions. Cons: The inability to pay in installments and problems during changes to a plan. Pros: Invoiced possesses the qualities of a great accounting software. It allows check processing, receipt management, partial payments, mobile payments, tax calculator and many more features. It has been a great and amazing tool for me with its flexibility, I haven't had much trouble with different invoices. Online invoicing and payments are also possible with Invoiced which gave my clients and me to settle statements online. It is a very great tool for an accountant. Cons: The unavailability of doing work through Invoiced offline is a great setback for me. There are times where work needs to be done on the go and internet connection is not available. Pros: I love the dashboard page - it provides an extremely helpful, visual look at key data (ex. the revenue we've invoiced vs. collected; the outstanding invoices we have out to our clients). Great summary of everything I need to know at a glance. Cons: I honestly can't complain about Invoiced. I've been using it for about a month now and everything has gone smoothly with no glitches or issues.